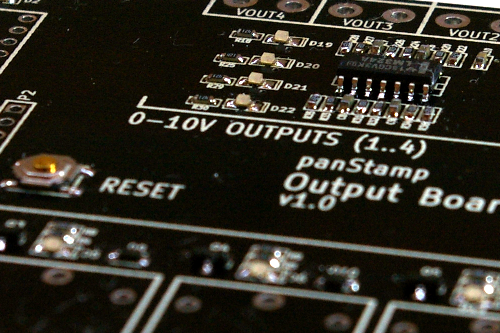 panStamps and Developer Kits are being shipped all over the world since the company started 45 days ago. It's now more than obvious that start-ups and independent developers are the groups the most interested in basing their projects on panStamps. New companies and small R&D teams know the importance of shortening developments and time-to-market whilst relying on well-backed open source platforms. Nevertheless, we want other professional groups to join the panStamp initiative in some way. Integrators, installers and enthusiasts with little time/resources to develop their own base boards often ask us about the availability of ready-to-use mother boards for panStamps. From the first day when panStamp was made public, we talked about the release of these boards for different purposes. One month later, this is a reality. We want to let you know about the new boards progressively, along the next days. An announcement per base board so we'll take the time to explain their intended purpose, some useful wire diagrams and relationship with the available sample sketches. With the new boards users will find a simple way to evaluate the panStamp solution and quickly deploy wireless sensor/actuator networks. Users will also decide whether to program the sample sketch, adapt it to specific needs or even write a new one. This is the strength of the open source concept combined with panStamp's flexibility and the "obsession" of making development processes damn simple and fast.